We love the Acrobats of Chinese heritage so much, that we’re offering two outstanding shows to choose from in Branson, Missouri! In fact, you don’t have to choose! You can see both shows and have a completely different experience. Plus, we have these incredibly entertaining shows on sale through Dec. 30, 2017. 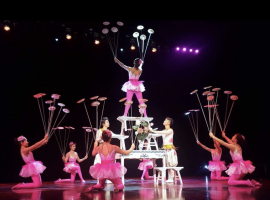 Amazing Acrobats of Shanghai perform at the New Grand Shanghai Theatre, formerly Mickey Gilley Theater, where the iconic Mickey Gilley and Johnny Lee still perform on select dates throughout the year. This beautiful venue is the perfect setting for a magical, mystical, breathtaking experience. The troupes are versatile and disciplined. This show has that wow factor that you’ll want to treat yourself and your family to. And it’s humorous too. Already affordably priced, this show offers a Family Pass as well as individual tickets. Mention this blog and receive a very special discount. And if one breathtaking show isn’t enough for you, try the Acrobats of China featuring the New Shanghai Circus. These troupes perform at the RFD-TV Theater on the corner of Hwy 76 and Shepherd of the Hills Expressway, just across the street from the award-winning Quality Inn West. This show offers VIP seating for an up-close experience in the first 8 rows of this incredible theater. Amazing views beyond from row 9 back offer a discounted rate without sacrificing quality seating, acoustics, and visibility. Don’t hesitate to call us for assistance with reserving your seats now, for either or both of these fantastic shows! Reservation Specialists are available Monday-Saturday 9am-5pm: 877-ENTERTAIN.